Winner: Kal-Cam's Calamidy Jane "Callie"
Runner Up: Dry Creek Pappomatic "Pappy"
Runner Up: Homeagain Islandtime Hunter "Hunter"
Runner Up: Homeagain Attagirl Pearl "Pearl"
2nd Runner Up: Berry's Taking Chances "Lotto"
The National Vizsla Association held its annual Championship field trial on The Sportsmen’s grounds near Grove Spring, MO on March 21st through 24th. It was the eleventh running of its National Championship and the 9th Running of its National Amateur Championship. Kal-Cam’s Calamidy Jane emerged victorious in the National Championship. She took home the title under the stewardship of Daniel Burjan. Callie is owned by Gordon Long of Millersville, PA. She scored 3 finds in a forward, edge-running hour. Hawk’s Pappomatic claimed the Runner-up honors. Pappy is owned and handled by Dustin Ochs of Emporia, KS. He had six finds coupled with an appealing ground effort. The new National Amateur Champion is Hawk’s Pappomatic fresh from his Runner-up winning performance in the Open Championship. Dustin and Pappy were in tune this week. Homeagain Islandtime Hunter received the Runner-Up honors. Hunter is owned by Paul Gryce and Bill Linnig. Bill handled Hunter to this important placement. The National Derby Classic was won by Fankell’s Shiloh Taz handled by Robert Tomczak for Thomas Fankell. Homeagain Attagirl Pearl placed second for handler Dan Long. Pearl is owned by Bill Linnig of Louisville, KY and is a product of Hawk’s Pappomatic. Third in the Derby Classic went to Berry’s Taking Chances owned by Mike and Carrie Syczlo of Greenwood, Indiana. Carrie handled Lotto to the placement. Lotto won this stake while still a puppy last year. The Drawing was conducted at the Clubhouse on the eve of the trial, March 20th. Dustin Ochs, and Mike and Darlene Lundy took care of the details. The National Championship drew 20 entries. The Derby Classic had 19 contestants. The National Amateur Championship attracted 10 dogs. The Grounds were in great shape, as always. The Sportsmen’s Club has done a tremendous job of managing these grounds for field trials. The cover holds the birds nicely and allows a dog to show well along the edges. With the help of AFTCA’s Twentieth Century Fund these grounds are able to continue as one of the nicest available to the general field trial public. This place is a prime example of the importance of contributing to the Twentieth Century Fund. Trial Chairman Dustin Ochs did a terrific job of organizing the trial. He handled all the paper details that precede an event of this magnitude. He acquired the Judges and replaced an advertised Judge, Mike Kinler, who was unable to attend. Dustin had a hard working crew that stepped up to the plate to handle the myriad duties that come with putting on a good trial. Field marshal duties were covered by Dustin Ochs and Mike Lundy. Many club members assisted with bird planting. Gordon Long, Darlene Lundy, Dustin Ochs, and Mike Lundy shared the dog wagon duties. Robert Tomczak, Gary Jagoda, Bill Linnig, and Greg Konan assisted the Marshals with the gates across the private property. Amy Vogt assisted Dustin with the paperwork during the course of the trial. The Judges for The National Championship and the National Derby Classic were Jim Couris and Bonnie Hidalgo. Jim has been successful in competition with German Shorthaired Pointers and Vizsla’s. He resides in Spring Grove, IL. As Jim pointed out, he just had to reverse the town name to come to Grove Spring! Bonnie Hidalgo, your scribe, hails from Brighton, CO. She competes with Irish and English Setters. Both Judges have spent many years around bird dogs and field trials. Judges for The National Amateur were C.W. “Bud” Moore of Toronto, KS and Ken Teague of Willard, MO. Both gentlemen have winning pointers. Bud has been involved in this sport for most of his adult life. He has judged many fine dogs in major trials around the country. 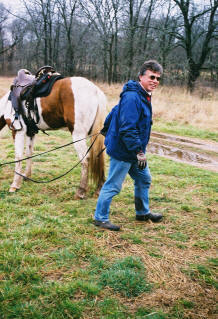 Ken has been involved with bird dogs for years and started competing in field trails several years ago. He is a member of the Southwest Missouri Sportsmen’s Association which manages the grounds here at Grove Spring. Both men knew what they were looking for and paid attention. The results they turned in came as no surprise to those who watched the stake. Nestle-Purina contributed generously to this National Championship. Roy Pelton a representative for Purina personally delivered Purina Pro Plan Performance Dog Food. It was awarded to the winners in each stake as well as those who assisted with various duties at the trial. The food is only the beginning of what Purina does. The financial aid this company gives helps defray the costs involved with putting on a trial of this magnitude. Hats off to Nestle- Purina PetCare! Tritronics donated a Pro 500 Collar that was awarded to the Open Champion. They also gave a Sport 60 Collar to the Amateur Champion. These are sought after prizes and the contribution from Tri-Tronics is very much appreciated. Kal-Cam’s Calamidy Jane won the National Championship with a strong hour performance and solid bird finding ability. She is not the first in her family to do so. Older siblings Kal-Cam’s Red Thunder Boy and Kal-Cam’s Go Girl have made successful Championship bids in previous years. Kal Cam’s Calamidy Jane performed on course two. Up the hill to start her hour, she was forward past the ponds and down the next hill. Callie made an attractive move through Melvin Cliff bottom and was rewarded at 16. She handled her game with excellent style and manners. At 24 she pointed on the edge of a feed strip; but corrected to work it through. When she came around she stopped to the left of her original stance; her brace mate was still standing where he had backed her. At first glance it appeared she was backing him and Burjan instructed Reid to flush. The bird was located in front of Callie and a divided find was credited. Callie pointed a third time near the end of Sycamore Valley at the ditch. She again displayed high style and good manners. She continued making strong moves and was briefly absent in the chute to the twin barns. Upon her return a single quail was ridden up; she stopped to flight. Callie did an impressive job on the ground. She grabbed her edges and stayed with them. It was a highly commendable performance that gained her the title of National Champion. The Runner-up, Hawk’s Pappomatic, appeared on Course three. He was strong and forward from the start. Pappy put on a fine bird finding display; running his course with intelligence. He showed well and made a difficult course look easy. He scored his first find at 19 on the far west end of the clubhouse hill. He was found by his scout, Mike Lundy. A single was flushed with all in perfect order. At 28 he pointed at the pond below the twin barns. It was a nice move that took him there but the work was barren. At 33 he pointed again, this just through the rock cut to the east of the barns. All was good here. His third find came just before the double gates at 44. He had his birds nicely located and was mannerly. At 50 Pappy pointed again; a few birds lifted as his handler arrived, the remainder of the covey was flushed in front of him. He stood the pressure without a flinch. He pointed along the creek bank at 54; again style, intensity and manners were excellent. At 58 Pappy pointed a sixth time. He had a covey nicely pinned but whirled to mark the flight. He was released to finish with a forward drive. This gained him the Runner up honors. Newman pointed at 10 with good style and intensity; birds were flushed with all in good order. Duke pointed with birds lifting at 12. He remained motionless while the rest of the covey flushed. He scored nicely at 14. The second brace released just off of Apple Tree Hill into Melvin Cliff bottom. Tuffy stopped to flush in the corner at 1 but the bird was not officially witnessed. She scored a good covey find at 6, dug into the timber. In Melvin Cliff bottoms a quail was in the air at 20. Tuffy took some ground before stopping. Taren pointed where the bird had been. At 34, Tuffy pointed at the ditch near the end of Sycamore Valley. Taren failed to back and was picked up. Tuffy showed excellent intensity and manners for flush and shot. At 44, on the way to the twin barns, Tuffy pointed a large covey feeding in the grass. She was very well mannered here. Tuffy worked the edges well; hunting intelligently. She finished with a non-productive near the blue house. Cash ran a big, strong race but went without birds. He pointed near the double gates at 51 but it was only a magazine. He finished forward. Thunder was the defending Champion; he ran well and hunted smartly. Thunder scored finds at 25, 47, and 49. At 54 he ripped birds and ended his chances. Hunter pointed at 41 but it was blank. He started well but became short and sticky. He was picked up on Apple Tree hill at 50. Axel ran at good gun dog range. He took birds out at 22, just into Davis Bottoms. Tommy pointed at 20 with Kansas backing reluctantly. It was not productive. Kansas pointed at 24 but released herself as the handler approached and was taken out of the situation. She showed classy carriage but found no game this hour. Tommy stopped with birds lifting around him at 48. His race shortened by 30 and he was picked up at 50. This pair ran gun dog races. At 42, below Daugherty’s house, the latter pointed. Sam came into the picture without it being clear if he’d seen Rogue and also pointed. A covey rose in front of him, he stayed with cautions spoken. Rogue was very mannerly. Rogue pointed again along the creek bank at 50. This time it was clear that Sam failed to back and he was picked up. A lengthy relocation did not produce game and the hour ended there. The seventh brace of the stake turned loose on Tuesday morning. The rain that came in on Monday evening was just ending and running was delayed until 9am. Striker started with some nice moves but his pattern was immature. He showed a fluid gait and class carriage. He went birdless and was up at 53. Eddie was gun dog in range. He pointed at 35 but was unsure and corrected. He put up a single and was picked up..
Farley backed politely at 16 and 31, showing good style. At 24 he backed but stayed pointed when his brace mate corrected. A single was flushed to his left. He showed excellent manners. Callie’s winning performance was listed above. Zorro broke strong and forward. 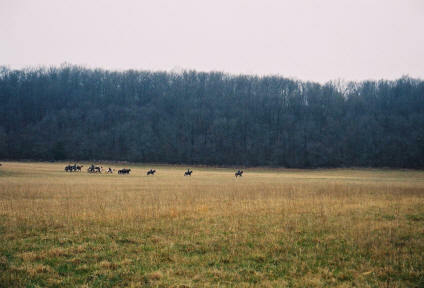 He went to the trees on the left side of Climer’s second pasture and returned a few minutes later with a bird. He was up at 7. Pappomatic’s hour was described earlier. Jazzmin scored an extremely stylish find at 6. All was in good order. She pointed again at 13; it was another pretty piece of bird work. Jazz pointed at the pond just before Davis Bottoms at 21 but no birds were produced. She ran a nice course for about 30 minutes but got sticky as the course came out of Davis bottoms. She finished her hour forward but not with her earlier zest. Gypsy showed great promise in the forward line running moves she displayed. She failed to back at 13 and was taken up. This Classic followed the National Championship and was run in its entirety on Wednesday. The nineteen young contestants showed the promise of bright futures. Fankell’s Shiloh Taz won this classic easily for handler Robert Tomzcak and owner Thomas Fankell. She scored two perfect finds. His race was somewhat inconsistent in the opening minutes but he quickly settled in to a steady edge running pattern. He was intent and high tailed on his birds with manners better than many adults. Homeagain Attagirl Pearl owned by Bill Linnig of Louisville, KY and handled by Dan Long was second. Pearl ran a superb race on a difficult course. She hit the proper objectives in fast forward moves. Third place went to Berry’s Taking Chances owned by Mike and Carrie Syczlo of Indiana. Carrie handled this big running female. Lotto ran with top speed and hunting desire but was not always forward. Judges for this stake were Jim Couris and Bonnie Hidalgo. They enjoyed watching this stake with its numerous quality contenders. They chose dogs that showed class, gait, ground speed and range coupled with hunting application. Prize money was donated by Sonny and Verla Mortenson of Draper, Utah. Beautiful leather goods were donated and presented by Gary Jagoda. Gary for several years has given a set of saddlebags to the winner and a shotgun scabbard to the runner-up. This stake drew an entry of 10 but it was full of quality performances. The Judges were Bud Moore of Toronto, KS and Ken Teague of Willard, MO. They announced that they had carried two good dogs but that the final brace moved them out of the winners circle. The 2005 Amateur Champion is Hawk’s Pappomatic owned and handled by Dustin Ochs of Emporia, KS. The runner-up is Homeagain Island Time Hunter owned by Bill Linnig and Paul Gryce. Hunter was handled by Bill. Hawks Pappomatic scored a find at 14 in Melvin Cliff bottom. He showed intensity and style on his game. Pappy’s second find came at the feed patch beside the ditch in Sycamore Valley at 21. His birds were well located, his style and manners were flawless. He scored again near the blue house at 39. At 55 he backed Hunter with excellent style. He finished forward and going away. His entire race was reaching and front running. It was a tremendous overall performance. The other two dogs that the judges carried were also braced together. They set an early standard, appearing in the second brace. They were carried until the final hour. On Point’s Grand Finale, call name Taren, was handled by Julie LaRue. Taren is owned by Medda Rauhut and Julie LaRue. She found game quickly with her first find at 2, just into Melvin Cliff bottoms. Her style and manners were appealing. At 19 she was found pointed in the creek bed. She was low behind but her legs were sprawled out as if she had slid into that position. She rose with the flush but took no ground. Taren ran her edges with a zest that took her forward at a desirable range. She pointed at the double gates after an excellent move took her around the entire right side of Sycamore Valley. All was in good order there at 34. Moments later, at 38 she pointed again, this just into the chute. Her birds were well located and her style and manners excellent. She hunted out her hour but slowed and shortened in the final moments. Shiloh’s Jazzmin was also in consideration. 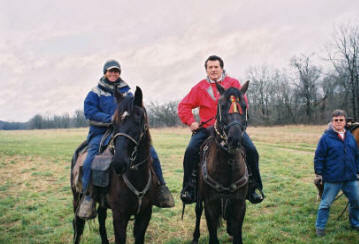 Jazzmin was handled by her owner, Robert Tomczak. She pointed along the ditch at 19, unable to see her brace mate which was already on point in the creek bed. Jazzmin stood high and tight through flush and shot. Jazz pointed again at 31 she took a step or two at the flush but was otherwise attractive. Her race was wide and forward; she used the objectives wisely. Jazz finished the hour with energy to spare and a big forward finish. Zorro pointed, forward on a feed strip at seven. Gypsy backed him nicely. The bird flew toward Zorro and he grabbed a mouthful of feathers. Gypsy was polite. She pointed at 12 but it was a nonproductive. Zorro found game again at 17, this time his manners were above reproach. Gypsy backed him briefly before moving in to steal point. Gypsy was picked up before Tomczak proceeded to flush. Zorro made some nice moves at good range. This brace has been described previously. Tommy was not himself and was picked up at 20. ET ran a respectable forward race. He dropped from sight as the course approached Daugherty’s. He was found pointed by scout Medda Rauhut at 39. All was in good order. He finished forward along Parks Creek. This brace ran course one following lunch on Thursday. Duke crossed the front behind a bird at 6 and was rounded up. Cowboy ran an adequate race with a find at 25. He pointed nicely but took a few steps at the flush. He finished forward. This was the brace worth waiting for; they were named Runner-up and Champion respectively. One of the members of the National Vizsla Association who gave so willingly of his time and was not afraid to pitch in wherever and whenever help was needed was Gary JagodaHe offered aid to the trial Chairman for this and for future events. I was in the Clubhouse the afternoon Roy Pelton walked in looking for help to load a thousand pounds of Purina Dog Food to bring it to the club house. Gary was busy, getting ready for the afternoon running, but he put that aside and immediately told Roy that he would help. After loading the dog food which was stored at Andy Daugherty’s, Gary rounded up more help to carry it to the clubhouse.